The new vehicle industry sales continued its decline in June. Aggregated sales data from the National Association of Automobile Manufacturers of South Africa (Naamsa) shows that industry sales were down 10.6%, year-on-year, with 44 939 new vehicles sold – 5 311 fewer than the same period in 2015. Total industry sales are down 9.9%, year-to-date. This comprises respective declines of 10.4% and 8.9% for the passenger car and Light Commercial Vehicle (LCV) segments. At the Car Of The Year banquet, in March, WesBank delivered its annual new vehicle industry sales forecast. It predicted that the industry would recede 10% during the first half of 2016. 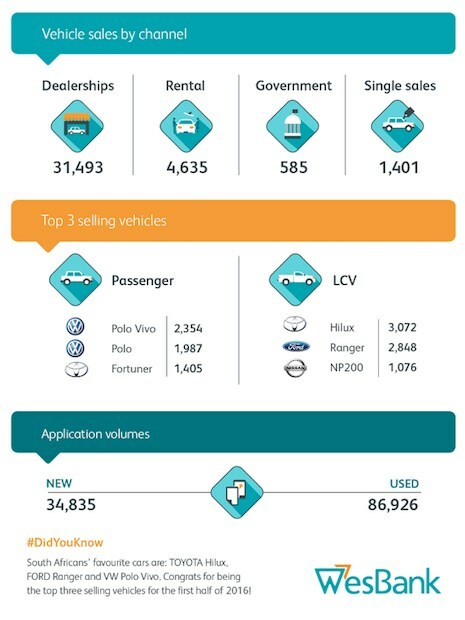 Passenger car sales through the dealer channel, where consumers are most active, plummeted 17.8% – correlating strongly with the decline in applications for new vehicle finance. This decline is indicative of new car price inflation and pressure on consumer budgets, which has resulted in a migration to the used market. Despite this, Light Commercial Vehicle (LCV) sales through the dealer channel rose 4.8% on the back of highly anticipated new model arrivals, including the new Toyota Hilux and Ford Ranger. The rental channel also saw a surge in demand, in June. Vehicle sales to rental companies were up 43.7%, year-on-year. That contributes to the 47.7% growth for this channel, year-to-date. WesBank’s internal data shows a corresponding decline in vehicle loan applications. 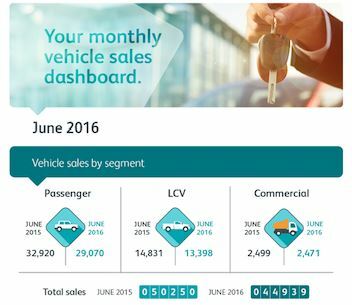 During June application volumes for new vehicle loans fell 19.2%, year-on-year. In contrast, demand for pre-owned vehicles weakened slightly by 0.2%. Consumers who are buying vehicles are also spending more, in line with new car price inflation as well as increasing demand in the used market. 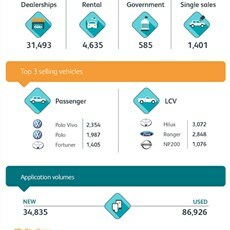 The average deal value for a new vehicle grew to R291 000 this past month – an increase of 11%, year-on-year. Average deal for used cars rose 10%, to R188 000.